In the foreword to Steve Draun's lecture notes, card legend Edward Marlo wrote, "Steve is very discriminating in his choice of methods and effects. 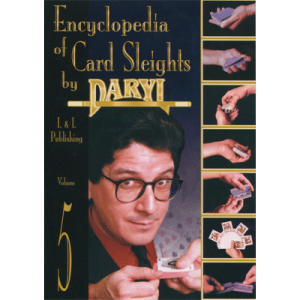 All the effects he does are direct and their plots are easily understood by laymen or magicians but their methodology is skillfully concealed from even the most knowledgeable expert." 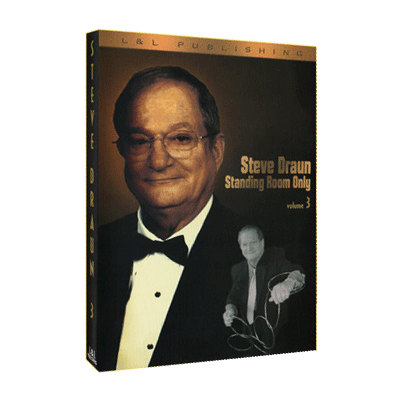 Now, for the first time in front of a live audience, you will see Steve Draun, one of Marlo's best and most gifted students, at the top of his form. PERFECT COIN VANISH - A silver dollar is vanished with both sleeves rolled up. Both hands are shown empty front and back - the hands are held out in front of the body the entire time - and then the coin is reproduced! ALL BACKS ROUTINE - A spectator is asked to select a card and is surprised to find that it has a back design on both sides. The performer fans the cards and shows that all of the cards have backs on both sides. Suddenly, the deck is returned to normal with backs and faces - and can be used for more effects as it is perfectly normal! QUICK CULL - After the spectator shuffles the cards, the performer finds the Aces with just a few flourishes. CENTER DEAL - A bluff Center Deal with a setup that looks so real, you'd swear that the Aces were in the center of the deck! COUNTING PUZZLE - Magicians will see an Elmsley Count but the results still don't seem possible! The ending even fools those who think they know the secret. BLUFF ACES - Some brand new twists on Marlo's classic effect. TRAVELERS - An updated version of Dai Vernon's timeless trick. The application of more modern palms and subtleties makes this standard even more deceptive. COPPER/SILVER - A practical, efficient and deceptive handling for a great classic of coin magic. ONE WAY DEAL - This is one of the tricks that made Steve Draun's reputation. An ordinary deck is shuffled by the spectator and the magician deals himself a full house in seven hands of 7-Card Stud Poker. TOPSY TURVEY - This is Steve Draun's handling of a trick invented by Marlo and included in his Riffle Shuffle trilogy. Most agree that it's the best of the seven versions created since the original. BONUS MATERIAL: CUT, PASS, CHANGE & SQUARE WORKSHOP - Learn advanced card techniques from the master. Though challenging, these moves, including work on running cuts, the Thumb Pass, the Mercury Change, and squaring a squared deck, will enable you to lift your card magic head and shoulders above the average card worker.